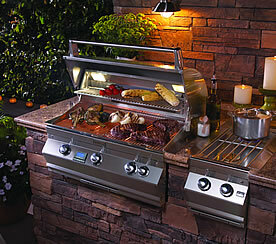 The Fire Magic Grill Echelon & Aurora Series. Outdoor Cooking at Its Best. Enjoy the tantalizing aromas and savory flavors of all the foods you cook to perfection when you barbecue with Fire Magic from the Robert H. Peterson Company. For nearly 60 years, Fire Magic's leadership in quality and pace setting innovations in design and engineering have increased the performance, convenience and durability of our barbecues. They include Fire Magic's exclusive Flavor Grid, which ensures better control of cooking temperatures, increases barbecue flavor and eliminates grease fires and annoying flare-ups. You can rely on the superior performance of Fire Magic Barbecue Grills & Accessories for many years to come. Choose your favorite from our wide selection of Natural or Propane (LP) gas models in porcelain or stainless steel finishes. Fire Magic Gas Grills offer unprecedented quality for relaxed, worry free outdoor cooking. Bringing a new level of enjoyment to outdoor cooking, our use of commercial gas grill design features in a family barbecue blends the best of outdoor cooking and entertainment. Whether using natural gas, propane or charcoal each individual slide-in or drop-in unit has been designed specially for easy use, low maintenance and optimum service. RH Peterson's solid reputation for setting the highest manufacturing quality standard in the industry is your guarantee of equipment satisfaction. Our gas barbecues are made of rust free stainless steel with an exclusive inner liner engineered to withstand 1500 degrees, more than twice the capability of other products on the market. Heavy-duty cast stainless steel, cast brass or cast iron burners create steady heat in a wide range of temperatures - low for rotisserie cooking and high to prepare the grill for searing meats. The automatic state-of-the-art ignition system gives you fast, dependable starts while precision-made brass valves put infinite temperature control at your fingertips. Our exclusive Flavor Grid vaporizes drippings for a natural barbecue flavor. It eliminates the mess of troublesome grease fires and reduces flareups. 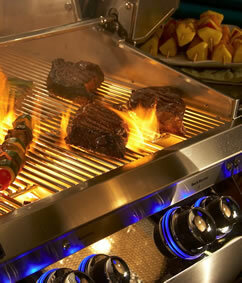 It is self cleaning and provides quicker control of grill temperature than any other system. The stainless steel smoke ovens with roll top styling for large prime rib, chicken or turkey, broiling or baking. The electric rotisserie has a powerful, durable and quiet motor. Also available are poultry holders and a counter balance for the rotisserie. A versatile 12,000 BTU gas side burner for auxiliary range top cooking convenience. Choice of cooking grids made from cast iron, porcelain coated cast iron or stainless steel rod. All Fire Magic Grills have been thoroughly tested by RADCO or AGA and CGA to meet or exceed national safety standards. All products come with one of the strongest warranties in the industry.